You can know everything about your camera and how to use it and still take bad photos. 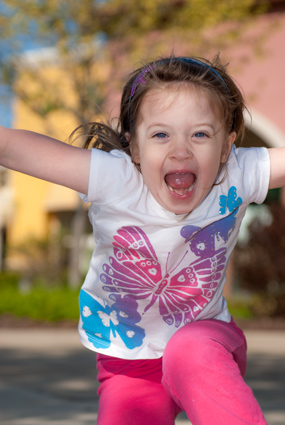 The art of photography is about taking something that people want to look at. To do that, you might have to train yourself to see how different elements in the frame interact. You can call it design, composition, or framing. No matter how you look at it, look at it! Keep the following in mind as you look through the viewfinder or at your LCD monitor. The rule of thirds is a tried and true method of framing your shots so that important elements lie along imaginary lines that divide the photo into thirds, both horizontally and vertically, as well as the intersection of those lines. The easiest way to imagine it is to visualize the frame as a tic-tac-toe board. Put strong horizontal elements of the scene on either of the two horizontal lines. Put strong vertical elements of the scene on either of the two vertical lines. Put other elements on any of the four junctions between the lines. The following landscape shows the rule in action. The river occupies the bottom third of the photo. The sky occupies the top two-thirds of the shot. 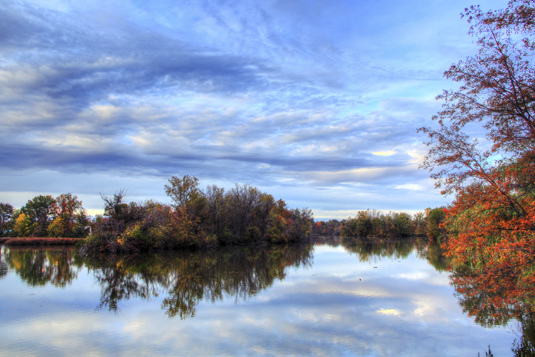 Trees on the far bank separate the two. This type of scene would look far less interesting if the photographer had placed the horizon in the middle of the photo. This guideline hold true for many things (flowers are a notable exception), but is especially true when photographing people. Don’t put someone’s head in the center of the frame. Put it in the top third of the frame when you take the shot. You may have to work at being able to focus your shots off-center (try picking a single AF point where you want their head to be), but keep at it. The following photo illustrates the point. If the girl’s face were directly in the center of the frame, the top half of the photo would have been wasted. Don’t take every shot standing up. Mix it up. Kneel or get down on the ground if you have to. You’ll be surprised at how changing your perspective can produce some amazing shots. 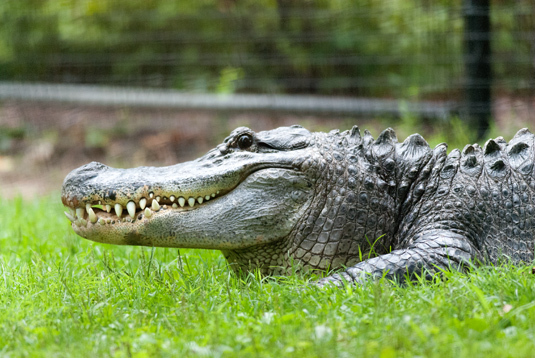 This shot of an alligator at the zoo is a case in point. The photographer put himself at the alligator’s level, and doing so created a more interesting photo than had he been looking down on the creature. Backgrounds are one of the most important elements in your photos. A distracting, messy, ugly background can ruin a photo. Always be on the lookout for these elements, and try your hardest to remove them or change your vantage point so that you can’t see them. 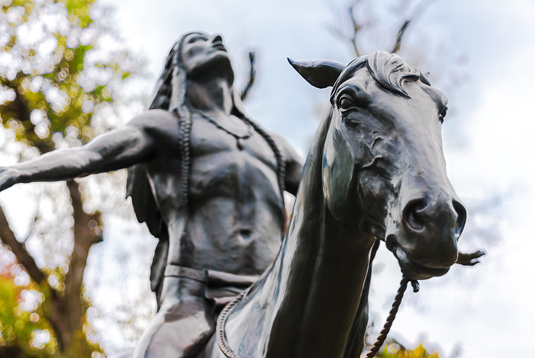 In this shot of a statue called “Appeal to the Great Spirit,” the photographer was shooting toward the trees in the background, not the busy city streets to the other three sides of him. He also pointed the camera upward to strengthen the statue’s presence and minimize the background. When you balance your shots, you take much better photos. 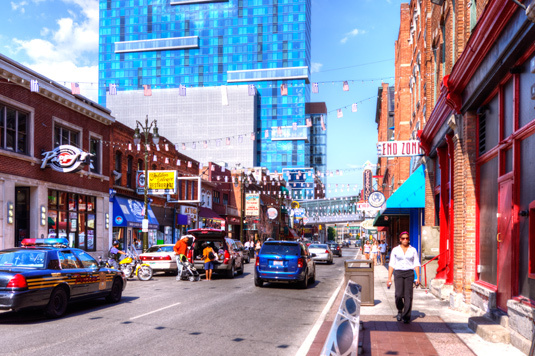 This scene of a street scene in downtown Detroit (the area is called Greektown) has a lot going on. Buildings, cars, people, streamers, signs, lines, shapes, and colors make it appear very busy. The photographer framed the shot so that everything contributed, but nothing took over. It all seems to balance. The street balances the sky. The buildings on both sides of the road balance each other. The blue building in the distance balances the sidewalk coming toward you. The people and cars to the left balance the woman to the right.